Notes and useful materials are available in the "Blender Interface" page. Click here to download the "Rapter_R-Left_Trace.jpg"
In 3D View's Property window, check "Background Images" and choose "Top" from Axis. Under Source:, click the folder icon and load up the image on screen. Lastly, input "21.5" as the size to zoom image in right scale. Inside "Tool Shelf", goto "Grease Pencil" and click "Ruler/Protractor" under Tools. LMB+Click and Drag to see the measurement. 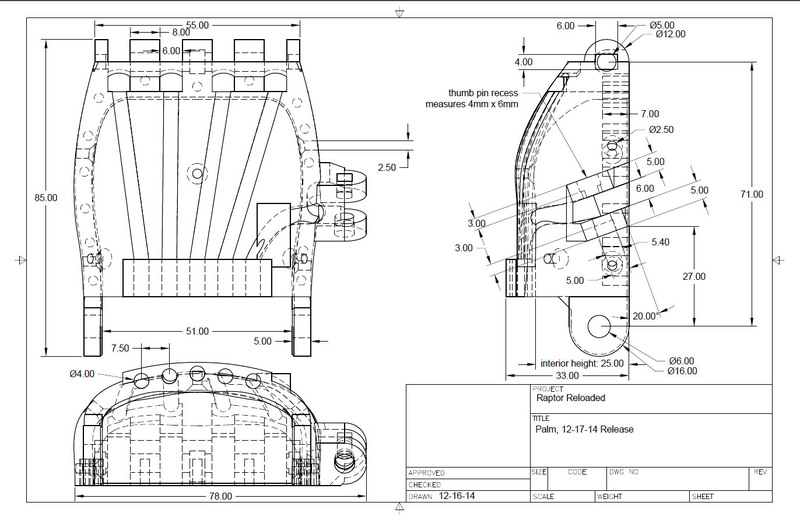 Hold Ctrl+LMB Click and Drag again to apple multiple measurements (*the measurements match with the diagram). To set units. Inside Blender's Property window, click "Scene" tab and under Units, click "Metric" and input" 0.01" to set units to Centimeters. You now see "cm" is displayed. 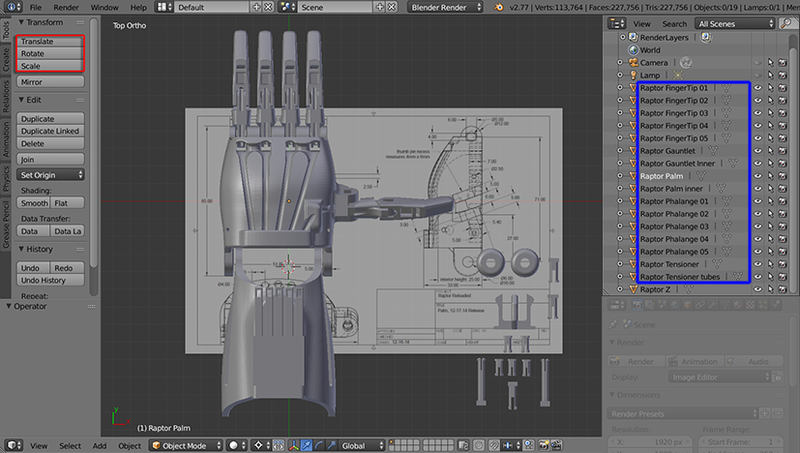 Download the "raptor's left hand stl" (on right hand side) or use the original "Raptor Reloaded by e-NABLE" file. 4.1). Goto File > Import > Stl. (stl). 4.2). 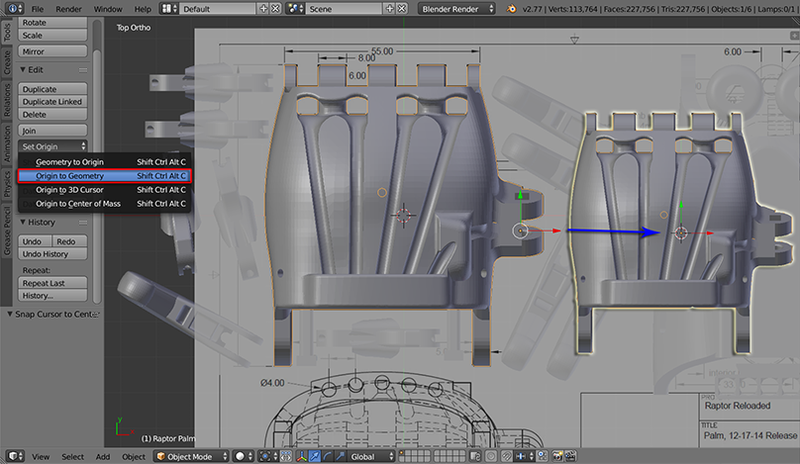 Then, select the right .stl and click button "Import STL" to load this model into scene. 4.3). Inside 3D View's Property window, input "0.1" in all XYZ under Scale to match the diagram. Hit "Tab" key to switch to "Edit Mode". Select a vertex from the palm component, hit "L" key to highlight all vertices (in orange colour), then hit "P" key and choose "By loose parts" to separate them all. Rename each item by clicking it's name inside Outliner and input the new name. Repeat to rename all key components from the .stl geometry. Use "Transformation tools" inside "Tool Shelf" to place all geometries into correct position. You'd download the "0529_raptorreloaded.blend" file on the right if needed. 9). Load your hand image to see the proportion. *You can "Rotate" and "Re-Size" the image fitting your scene. This process would take a long time and you need to be patient! 11). Select all individual geometries and hit "Ctrl + J" keys to merge them into one single geometry. press "Shift+Ctrl+Alt M" keys together to call the feature and Blender would highlight all the non-watertight edges if the scene has any "non-manifold" parts (alike the highlighted parts from my demo scene). * Pls. refer to tutorial "I MAKE 07" to learn how to use Blender's 3DP toolbox as wish but we'd use the free feature underneath for this workshop. Use Free netFabb repairing tool by clicking https://modelrepair.azurewebsites.net/ (need to sign in with a Microsoft email). Then use 3D Builder (comes with Windows 10) to save from .3mf to .stl alike the second image underneath.